*You can also check EBay for good used carts. Often you can find metal carts at a lesser price there. Our carts are guaranteed for life. They seldom break, as PVC is very durable, but if they do, we repair or replace for only cost of shipping. 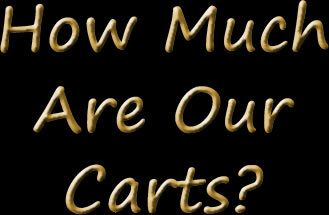 It is recommended that you send your cart back to us approximately once a year for refurbishing. We replace all wraps, wheels and padding for no charge except shipping. 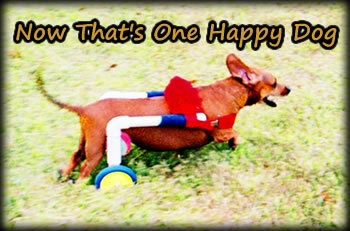 This will insure that your pet always has a cart that looks and acts like brand new! We ship USPS ( U.S. Postal Service). Depending on where you live, STANDARD (Parcel Post) takes 5-8 business days and PRIORITY takes 3-5 business days. * PLEASE NOTE: Overseas and Canadian orders can take up to 2 1/2 weeks to arrive once we mail them. Customs can hold packages for inspection. Unfortunately we have no control over that part of the journey, it is a random system of inspections. So, always plan for at least two and one half weeks for delivery. We can ship FED EX or UPS upon request, but we have to get a quote for you once the cart is built and we package and weigh it. Generally, these prices are at least double our USPS prices, sometimes more, depending on speed of delivery and destination.